First Canadian Place is named for Canada's first bank, the Bank of Montreal. Designed by Bregman + Hamann Architects with Edward Durell Stone as design consultant, First Canadian Place was constructed in 1975 and originally named First Bank Building. The tower and associated buildings occupy a block once home to two major newspapers, the Toronto Star’s Toronto Star Building and The Globe and Mail's William H. Wright Building. The site was the last of corners of King and Bay to be redeveloped in the 1960s and 1970s, and a major bidding war began over the property. The then little known firm of Olympia and York eventually obtained nearly the whole city block, though the election of reformist mayor David Crombie led to new rules banning skyscrapers and it took three years of lobbying before permission for First Canadian Place was granted. When completed, the building was nearly identical in appearance to Stone's Aon Center in Chicago, Illinois; completed two years previous as the Standard Oil Building, the Chicago tower is of the same floor plan and clad in the same marble, the only overtly visible difference being the vertical orientation of the windows, as opposed to the horizontal run of those on First Canadian Place. First Canadian Place was the 6th tallest building in the world to structural top (currently 103rd) and the tallest building overall outside of Chicago and New York when built in 1975. It was also the tallest building in the Commonwealth of Nations until the completion of the Petronas Towers in Kuala Lumpur, Malaysia, in 1998. The Bank of Montreal "M-bar" logo at the top of the building was the highest sign in the world from 1975 until overtaken by the sign atop CITIC Plaza in 1997. The roof is still the location of a number of antennas used for radio and television broadcasting. The structure contains 29 elevators, and is one of only a few buildings in the world that uses the double-decked variety, and is connected to the underground PATH system. The building was pictured on the front and rear cover of the 1981 album This Is the Ice Age by Canadian New Wave band Martha and the Muffins and also their 7" single "Women Around the World at Work". The album featured two photos which were taken from the same place but at different times by Muffins guitarist Mark Gane using a time lapse camera and features the building at midday and dusk. The 7" cover again features the same photo but has 9 small images taken at various times of the day and night. The same white Carrara marble used on Aon Center was employed as an exterior cladding and interior finish for First Canadian Place, with approximately 45,000 marble panels weighing around 200 to 300 lb (91 to 136 kg) each. Foreshadowing what would take place with First Canadian Place in 2007, one of the marble slabs of Aon Center, when it was named the Standard Oil Building, detached in 1974, falling and penetrating the roof of a neighbouring building, resulting in an eventual recladding of the entire Aon Center in white granite between 1992 and 1994. This problem would surface at First Canadian Place as well, during an intense storm on the evening of 15 May 2007, a 1 by 1.2 m (3 ft 3 in by 3 ft 11 in), 140 kg (310 lb) white marble panel fell from the 60th storey of the tower's southern face onto the 3rd floor mezzanine roof below, causing authorities to close surrounding streets as a precaution. In late 2009, owner Brookfield Properties announced it would follow the example of Aon Center and, over three years, replace the tower's 45,000 marble panels with new ones in glass, those on the main expanses with a white ceramic frit and the corners in a bronze tint. Brookfield and the co-owners also launched a multi-faceted rejuvenation program, including "upgrades to the building's mechanical, electrical, and lighting systems that will redefine the standard for enhanced performance, comfort, and greening". FCP's common areas including upper and lower level entrance and elevator lobbies, the retail concourse and Market Place were to also undergo renovation, with new natural stone flooring, fritted glass accents, brushed metal handrails, landscaping, and water features. The rejuvenation program design architects were Moed de Armas & Shannon Architects and Bregman + Hamann Architects were the architects of record. The entire project, completed in 2012, cost was in excess of CA$100 million, paid by the owner. This extensive capital improvement project was intended to provide a new exterior for FCP and eliminate the maintenance costs associated with marble upkeep. The Amateur Radio Digital mobile radio repeater for the Greater Toronto area (VA3XPR) has its antennas mounted just above the broadcast antennas on the radio mast. ^ a b "First Canadian Place". CTBUH Skyscraper Center. ^ "First Canadian Place". SkyscraperPage. ^ McMillan, Greg (12 June 2007). "Two buildings, two cities, one problem" (PDF). The Globe and Mail. p. B10. Retrieved 24 September 2009. ^ "First Canadian Place". The Skyscraper Museum. Retrieved 24 September 2009. ^ Doolittle, Robyn (16 May 2007). "King St. to stay closed". Toronto Star. Retrieved 2014-05-02. ^ "Commuters Dread Second Day Of Gridlock As King St. Stays Closed". CityNews. 16 May 2007. ^ Yang, Jennifer (2009-09-25). "Bay St. landmark to lose its marble". Toronto Star. Retrieved 25 September 2009. ^ a b "Brookfield Properties Announces Recladding of First Canadian Place in Toronto" (Press release). Brookfield Properties. 23 September 2009. Retrieved 2014-05-02. 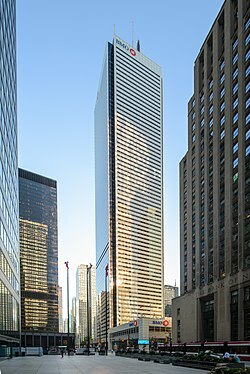 ^ "First Canadian Place – Recladding". B+H. Archived from the original on 27 January 2015. Retrieved 27 January 2015. ^ "Tower Site of the Week: First Canadian Place, Toronto". 12 August 2006. Retrieved 2014-05-02. ^ "About Us". First Canadian Place. Retrieved 1 July 2013. Wikimedia Commons has media related to First Canadian Place.